Just A Car Guy: Sailor Tony Pizzo was bet today's equivalent of $50000 that he couldn't bicycle handcuffed to his machine from Los Angeles on May 19th to New York before Nov 1st. He arrived Oct 30th 1919. 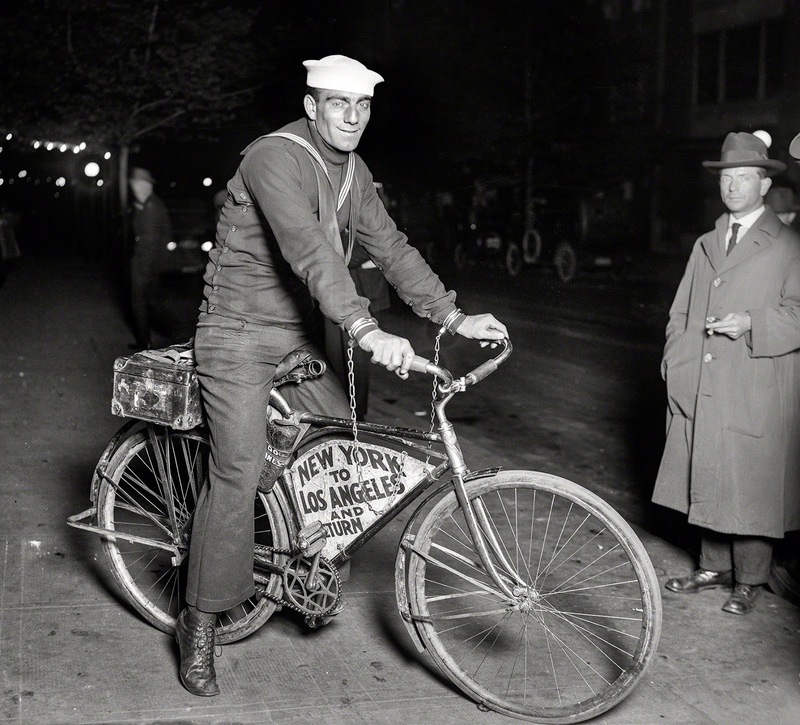 Sailor Tony Pizzo was bet today's equivalent of $50000 that he couldn't bicycle handcuffed to his machine from Los Angeles on May 19th to New York before Nov 1st. He arrived Oct 30th 1919. 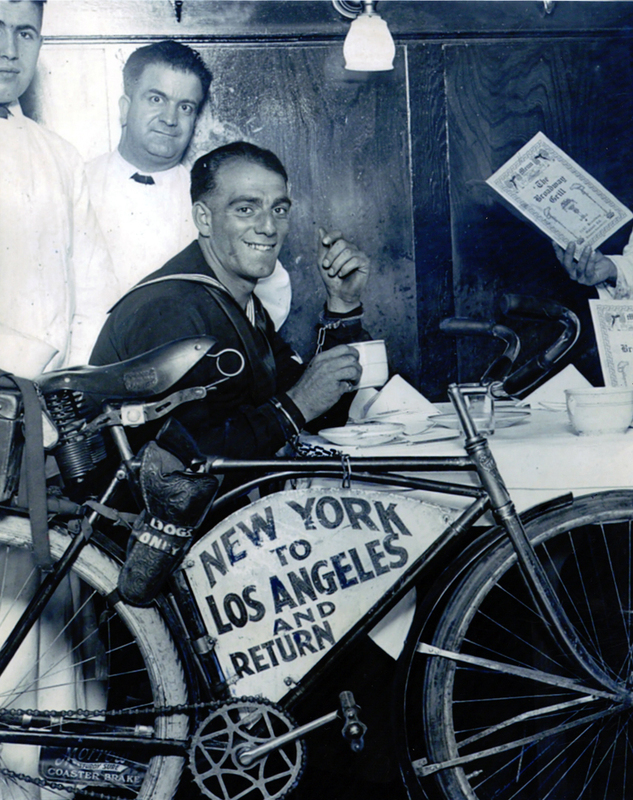 On Oct 30th, 1919, Tony Pizzo arrived in New York City chained to his bicycle. He had pedaled 3,000 miles in five-and-a-half months, attached to his bike by a three-and-a-half-foot chain and handcuffs welded shut around his wrists. 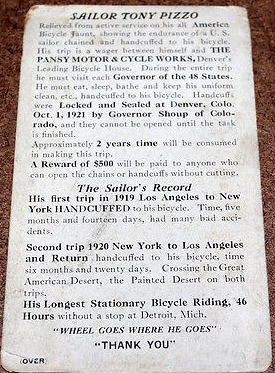 These restraints had been sealed in Los Angeles the previous spring by Fatty Arbuckle, who had wagered that no man could ride a single-speed bicycle across the country, and offered to pay $3,500 (around $50,000 adjusted for inflation) to anyone who could—as long as they arrived in New York City before November 1. Fatty had an ace up his sleeve. The man that mentored Charlie Chaplin and discovered Buster Keaton and Bob Hope had a keen understanding of men. His friend, Tony Pizzo was a sailor with the US Navy during the first World War and was recently married to a young actress at Paramount Studios. If anyone could accomplish the feat, it was Tony Pizzo. “The Navy would only let him do this ride if it could be combined as a recruitment stunt as well,” says his granddaughter Annette. “That was approved by the Assistant Secretary of the Navy, FDR.” During the ride, Tony’s uniform “had to be kept neat and clean at all times.” Governors along his ride route would verify the state of his uniform by writing confirmation letters. Tony Pizzo succeeded, and the fact that he had a young pregnant wife may have offered a lot of motivation. They needed the money. Arriving in NYC to fanfare and acclaim at the end of 1919, Sailor Pizzo meets Franklin Roosevelt and is reunited with his friends and the makers of the bet. Happily, the best gift is waiting for him - Fatty brought his wife and newborn son. 6 months later set off the same way to Los Angeles , with handcuffs sealed by Mayor Hylan in New York April 24th and are not to be opened until his return to that city. For the second ride, Tony was to travel from New York City to Los Angeles, then turn around and ride back to New York City to claim the $5,000 purse a Chicago-area bicycle club had put up. OF course, the money sure helped, and maybe getting away from a lot of diaper changing wasn't overlooked. 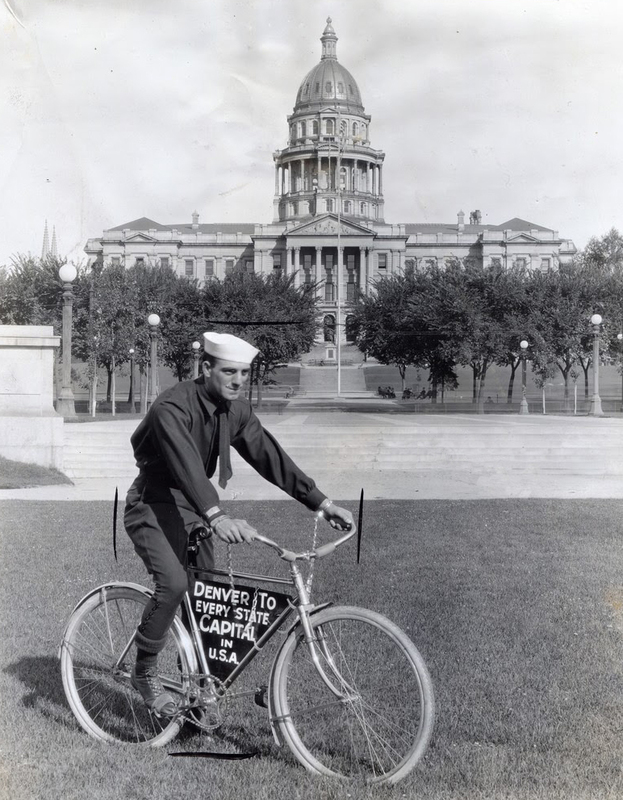 His goal on his 3rd trip was to visit each capital of the 48 states in the union, and on October 5, 1921, Colorado Governor O.H. Shoup sealed Pizzo’s handcuffs before he rode south to New Mexico, headed to Austin, Texas. above image from the book "Our Navy, the Standard Publication of the U.S. Navy, Volume 13"